On this day – February 14th, 1981. £155,000 comeback for Lindy Lou. Where the headlines in our local newspaper that evening. One of Wolverhampton’s oldest buildings has been restored to its original condition after 14months’ work, costing £155,000. This was, of course, the former Hand Inn, Tunwall Street. 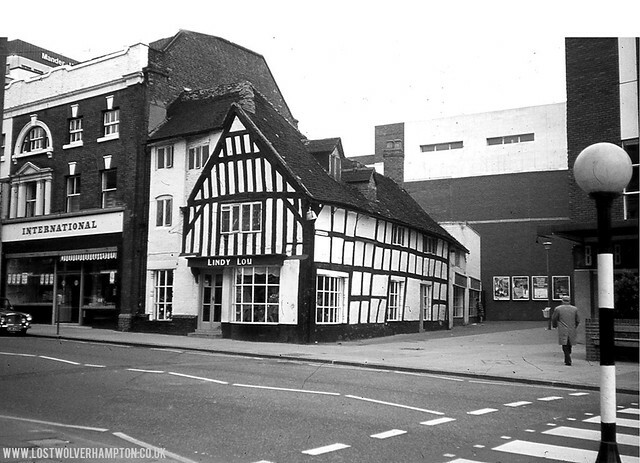 A timber-framed house dating probably from the early 16th century, which still stands on the corner of Victoria and John’s Street, just a few yards away from where Stephen Jenyns, in 1515, chose as the site for his new Grammar School. 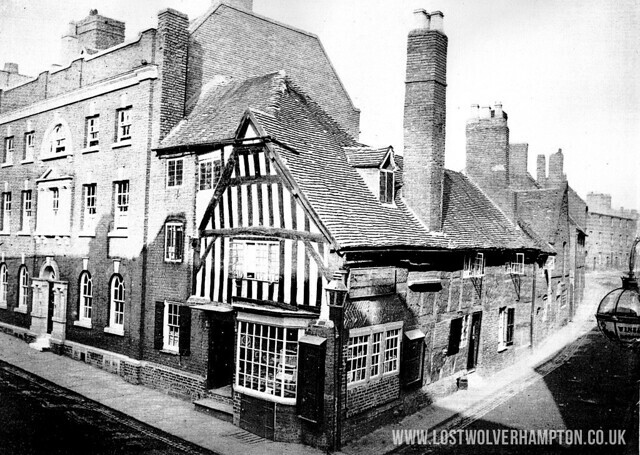 The Hand Inn, as it looked around 1880. The earliest recorded use of the building was in 1604 when it was a leather tannery. Later it became a public house “The Hand Inn”, a Bakery, a Cafe, “The Copper Kettle” then a shop “Lindy Lou”. 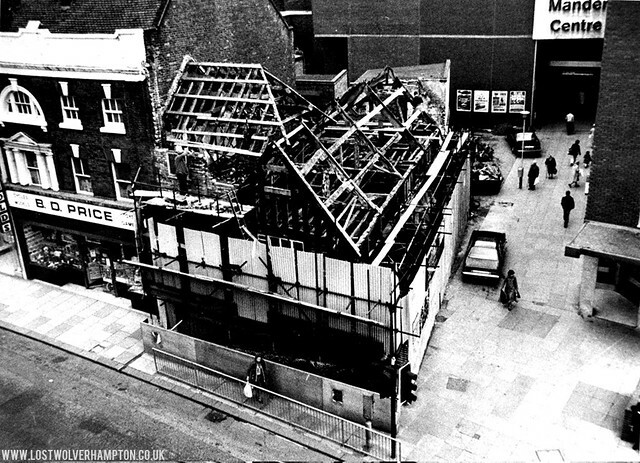 The Lindy Lou building, as it was then known in 1979, was beginning to show the results of centuries of wear and tear. 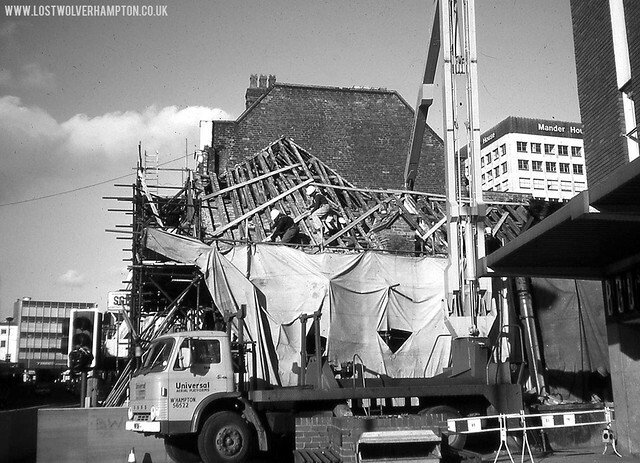 It was found to be suffering from wet and dry rot with part of it leaning into Victoria Street and part toward the Mander Centre. Thankfully Wolverhampton Council decided to restore this vital piece of the history of the town and the search for a suitable builder went out. Major Roof work taking place on the corner of St John’s Street. The contract went to a Wolverhampton firm, Royle and Stanley of Lewis Avenue, Heath Town, which specialised in building conservation work. The firm used as many of the original materials in the building as possible, but 30 per cent of the old oak timbers had to be replaced. Oak, specially treated to match the old building, was used to replace structural beams, windows, and door frames. Almost in danger of collapsing. Corrugated sheeting guards Lindy Lou’s during restoration work. At one point, the whole building had to be jacked-up while rotten base beams were taken out and replaced with new ones. Extra time was taken by the contractors to be able to use traditional methods of installing beams so that the character of the building should not be spoiled. Thankfully it did rise again. The building restored to its (Questionable) former glory at a cost of £155,000. After the long job of renovating the building was completed an exhibition opened there showing the history of the building. Archaeological remains, some dating back to medieval times, found in a dig at the rear of the building, were also on show at the exhibition. 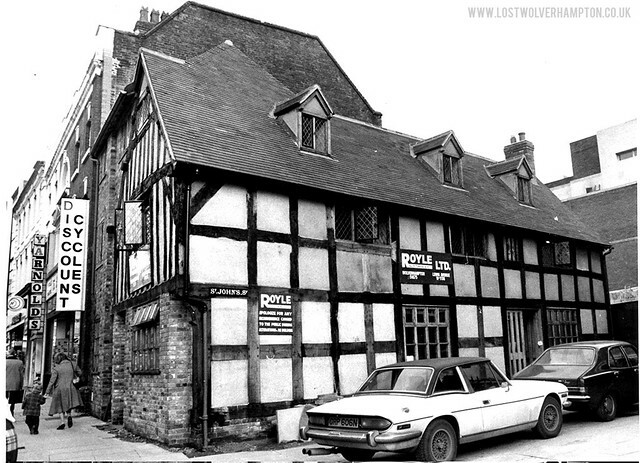 Over the last three decades since its restoration, it’s had various occupants perhaps the longest and most suitable tenant was the Old Wolverhampton Books and Collectables. But now today, he like many other town tenants has unfortunately left to pursue his business online. There is no doubt looking back at the earlier photo’s of No. 19 Victoria Street today it has been an amazing transformation. But whatever your opinion. It’s still a satisfying visible link with our diverse history – that, thank God, has managed for at least four hundred years to evade the wrecking ball. An amazing story of an amazing building. Thanks Billy.